Strength is the eleventh (and sometimes eighth) Major Arcana card. 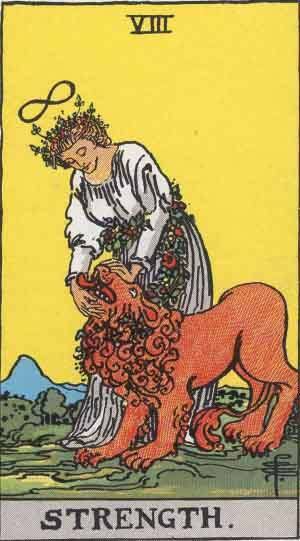 It was originally called Fortitude, and is linked with Justice and Temperance, and is a very positive card indeed! Strength represents discipline and control, mastery of yourself and your immediate surroundings. Past – Strength in the Past position represents a time in the past when you have taken control of something and it has really paid off, it’s put you where you are now! You probably aced that exam or got that promotion, or passed that driving test! Well done! It’s given you the boost you need! Present – Strength in the present position represents your burgeoning mastery of your field. Things are getting better, just continue what you’re doing and everything will be okay. You’ve come out on top. Future – Strength in the future position is a good sign. Anything that is bothering you now will seem like nothing in the near future. It happens all time time. Just think about your worries generally. How often do you think about things that happened 6 months, 1 year, 5 years ago, that used to affect you so much then, but now just have no impact? Time deals with all your problems. Work / Education – Strength in regards to work or education means that things are going well. Every day we overcome things that used to challenge us, and now they seem like second nature. In short, don’t worry about work or schooling. If a problem is currently worrying though, spend some time to think about it and especially try to draw analogies with other aspects of your life. Romance – Strength in romance is good news. Again, romances are a series of problems; getting t know people, what they like and don’t like. If you’re not in a relationship, and want to be, now is the time. Treat your singledom as a problem, and take control of it. Friends – Strength in regards to friendship means that you might become a more dominant personality in your group of friends. A new avenue might open up that you already have experience in, and now you’ve got the opportunity to teach your friends how to do it. Don’t get cocky and bossy though. A good leader is one thing, but people recognise when you overstep your bounds. Money – Strength in regards to wealth is a good outcome. You might get an unexpected bit of money, or something crazy like winning the lottery. It’s a good time to handle your money is a safe investment like a house. Health – Strength would suggest a good outcome in regards to health. Set yourself goals and stick to them. Now is the time to practice endurance over inaction. Endurance is what keeps the human race going. You can keep going! it’s an odd mindset to get into, but the only reason for you to fail is if you stop. Spirituality and Mentality – Strength in spirituality suggests that might come to a sudden realisation about your chosen spiritual path. Previously unconnected ideas will link up and form a web of connections. Look into something unrelated to your current religious view. Are there analogies there? Are there similar stories and mythologies? It might be worth reading up on. Strength in reverse reflects a lack of energy and willpower and drive that may be striking you right now. Remember, it’s normal to need feel on top all the time. If you are feeling weak in any aspect of your life, look at what you can still accomplish. No matter your level of strength, you can still improve. Weightlifters will always start small. Sometimes, something in life can knock us back to square one, and we have to accept it. Life is not a linear progression from strength to strength, and the strongest among us have failed many times over. We’ve selected live tarot readers to give you a FREE 3 Minute interpretation of the Strength Tarot Card! Scroll through them below and pick your favorite one.